commenting on a couponing forum to a gal about how her addiction to brownies no longer needed to be hindered by the expiration dates on her mixes if she was properly equipped with a FoodSaver. Unfortunately, a naïve, very ill-informed person got after me and claimed that it was unethical and just plain wrong for me to tell anyone that they could store any food product for that long. She even went so far as to present the grid that FoodSaver publishes which is their official claim in terms of how long food can be preserved with the benefit of a FoodSaver. (Obviously, the claims were nowhere near the time periods I had expressed.) So, today’s article is in honor of those who have been duped into believing that the expiration dates printed on a food product are some kind of a Cardinal rule to live by. And I’m even going to tell you exactly why they are not. First of all, let’s face it. Food doesn’t poison a person. Germs and molds IN the food do. So let’s make sure we’re battling the correct culprit here. If you can store a food in such a way that you inhibit the growth of “critters,” then you will outlast the deadline of any of the expiration dates on the planet. Oxygen, light, and heat are your enemies when it comes to preserving food. If you can control the exposure your food has to those beastly enemies, then you can control the longevity of your foods. One of my personal food storage heroes, Wendy DeWitt, has successfully stored Snickers candy bars for eight years by adhering to this battle plan. (How she refrained from eating it that long is beyond me.) The Snickers tasted just as wonderful as it did the day she bought it. I have successfully stored brown sugar, brown rice, oats, Keebler Fudge-Striped Cookies, nuts, chocolate chips, Peanut M&Ms, pudding mixes, Rice-a-Roni, and other packaged foods (even with hydrogenated oils) successfully in my cool, dry, basement for over 10 years by eliminating oxygen, light, and heat! Of course there’s no manufacturer on the planet that is going to say “You can store this $2 box of cake mix for 10 years, so stock up when they are on sale and never think about buying them again for 10 years”, right? Think about this for a moment. You can store sugar for years and years. You can store cocoa for years. You can store spices for years. And you can store oils for years. So what makes a package of brownie mix exempt from being stored just as long? Oh. It’s those mean, ole’, ugly, expiration dates on there, eh? About 8 years ago I read a study that the Army had done to determine the expiration of MREs. (I WISH I had known that I would be writing like this professionally many years later so that I could provide it to you. But even a lengthy look on Google didn’t turn up anything—yet.) While MREs are indeed created to undergo more extreme storage conditions, the key results of the study were interesting. The Army study discovered that despite the intended 3 year expiration dates posted on MRE's, the meals continued to provide their original nutrition value for 25 years and only then began to have coloration variances. The Food Saver is WELL worth the investment. We love ours because it makes stockpiling a lot easier. Of course, storing leftovers in Food Saver bags is also nice because they tend to take up less room...and are very easy to reheat the next day. I was a naive expiration date believer until I married my scientific husband. Now he's got me eating past dated refrigerated and dried goods all the time. Someday I'll get me a food saver, when we can afford it. Can't wait! I just picked up the regular and wide-mouth size Foodsaver attachments at Cabelas.com last week. $9.95 each. And I have been having so much fun ever since! I just bought 3 litres of Canola Oil for what seemed like a screaming deal, but couldn't find the expiration date. I went to the company website and got the information to decode the numbers on the Oil. 33028 means the Third Quarter; the 3rd month of that quarter; the day and the year - So the oil was manufactured on Sept 2, 2008. Great...it's only supposed to be good for a year from the manufactured date...tomorrow! No wonder it was such a good buy...How much longer do you think it will be good for? Really good information, thank you so much! First of all, I think you should take the oil back and exchange it for better dated oil. Good buys are not supposed to be because the product/shelf life is compromised. If you store it in a cool, dry place with no regular light, you should be fine for an extra 18 months past the expiration date on oils. However, I would consider purchasing shortening for as much as you are able to use, as it will store 5 years unopened in quality storage conditions. Olive oil is also a great investment. Cold Pressed Coconut oil will last almost indefinitely if stored properly. Again you are on top of your game! I love my food saver and have many foods that I have had in storage for years; as long as the lid stays snug they are great. I have had a couple that evidently weren't sealed well enough and the lids came loose. Since the foods were dry packed they were okay. It is important to occasionally inspect the foods to be sure the quality is still good. Wendy does it every New Years Day, samples one of each variety or item and then either reseals it or puts it into rotation for the coming year in her pantry. When we moved 1200 miles last year I simply slipped each jar into a plastic grocery bag (another way to recycle them) and packed them adjacent to each other in the boxes that #10 cans come in. All boxes are the same size so they stacked very nicely on the moving truck. I did put a screw-on band on each jar just in case the jarring (pardon the pun) of the truck was to vigorous but not a problem with any of them. This is one appliance that I would not want to do without! They make great wedding gifts! I add my endorsement to these comments about the Foodsaver. So far we've "canned" all of our dehydrated veggies and our chocolate stash using the suction method. We also converted a 4-drawer filing cabinet into a storage area; it holds quite a few jars, stays dark inside, blends in with the home office environment, and can be locked if need be. Thanks so much for the good info. I am a new Food Saver owner but I am already a believer. I absolutely love this thing and am picking up accessories as I find them!! Thank you so much for this information. I am printing it off to give to my mom tonight. She won't even touch something that's beyond it's expiration date so this will be good information to share, especially as I'm encouraging her to start their food storage. Love your site, as I'm new to storage too. Thanks for all the great articles! I would love your opinion on this new Food Saver gizmo...seems pretty affordable up front as long as you can reuse the bags. What do you think? Unnecessary if you have the regular food saver already? I checked it out. I like it for the purposes of sealing the wide mouth jars. That's a heck of a lot less expensive than the other one. I bought one on e-bay the other day for 40 bucks or so with the shipping. But yes, unnecessary if you already have a Food Saver. Otherwise, I'd say go for it! How would you use it on jars? There's a wide mouth jar attachment you can obtain and use. Read the Hierarchy of Fruits and Vegetables article I wrote earlier this week. That will explain it. I seem to have trouble making new lids seal properly on mason jars. I have been saving nice used lids for a couple of years to use for target practice. Tried one just for a lark and it sealed up great. My wife is kind enough to wash them with the regular dishs. So long as they are clean and seal up I don't see the problem with using them. Are you talking about making them seal under pressure or with a FoodSaver? Nice article! Expiry dates and other dates on commercially packaged foods are often quite confusing to consumers. I keep a very well stocked pantry exceeding the goal of keeping a 1 year supply of food. In reality my pantry stocks would last closer to 2 years. A good portion of my pantry stock is home canned foods and at over 1,000 jars per year it does add up :) I also dry a lot of foods so the FoodSaver is a must. 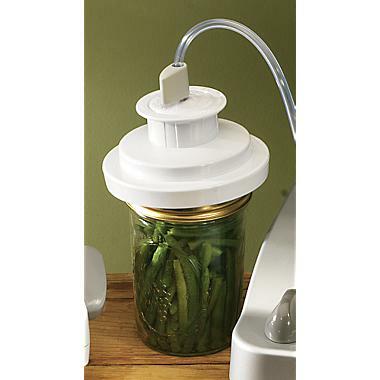 The picture depicting the mason jar sealer is a bit misleading as a FoodSaver is not a substitute for proper canning. Green beans would require actual heat processing. I like vacuum sealing dried foods in mason jars and recycled mayo jars for longer storage. The canisters are great for shorter term storage. The FoodSaver mason jar sealers are available in both widemouth and standard sizes. If you can't find the size you need check their website as you can likely order online. I just received my regular mason jar attachment in the mail. It doesn't work. I called Foodsaver, and they gave me afew tips, but said they would send me out a new one in a couple of months when they have them back in stock. There is a review that says the regular one does not work. Have you had a bad experience with this attachment? Perhaps Foodsaver is out of them because of this problem and they are making a new design? I stack two lids (flat lids) on top of each other and it's worked just fine for me. where do i buy the FOODSAVER and attachments? I had so many dried tomatoes and potatoes, I used the 1/2 gallon jars. I have found that my wide mouth jar sealer is hard to remove and the seals are hard to remove, and that is a good thing!!! I purchased honey, oil, vinegar and molasses in 5 gallon buckets. I have now transferred all of that into 1-gallon glass jars (the kind apple juice comes in) ~ only thing is, I don’t know how to make them airtight. The jar top is too small for the reg jar lid, on the other hand, the top is too large for the small wine bottle size lid. I don’t want something to grow inside as it is not airtight. Any suggestions? I don’t believe there is a ‘time line’ for honey, vinegar or molasses? I have olive oil in tin cans (was told that it would last almost indefinitely in tin? ), and coconut oil is in gallon food grade plastic. You don't have to worry about the honey and vinegar so much as you do need to be mindful of the molasses and oil. As I'm sure you know, those are some pretty pricey items to "ruin." Did you check into gamma lids? 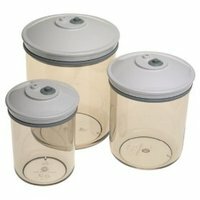 I loathe the company Emergency Essentials, but they have the gamma lids on sale for $6.50 each right now. I'd invest in a sure way of sealing those items. Olive oil won't last indefinitely as a broad statement. It all depends on what kind of olive oil it is. It will indeed get rancid over time if it's not the Extra Virgin. I've used cake mixes and such 7 to 8 years after their sell-by date. But I preserved them exactly as you described. I'd do the Hamburger Helper mixes the same way. OK, so I have some Albertson's brand apple juice that says use by 2006. I opened one today and tasted it - it was delicious. I have several bottles - should I throw them out just to be safe? I have mine last 7 years with a DRY, dark, and cool environment, but this may vary by what KIND of oil is in the mix and what type of mix it is.